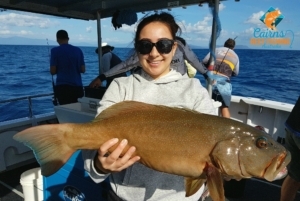 Cairns Reef Fishing - Your mate, Coral Trout! The #CoralTrout have been absolutely firing out on the #Reef these last couple of weeks!! Great numbers and plenty of them up to & over the 3kg mark..
Here’s a nice, healthy specimen caught on a Shared #Charter aboard the #BlueWhaler this morning!